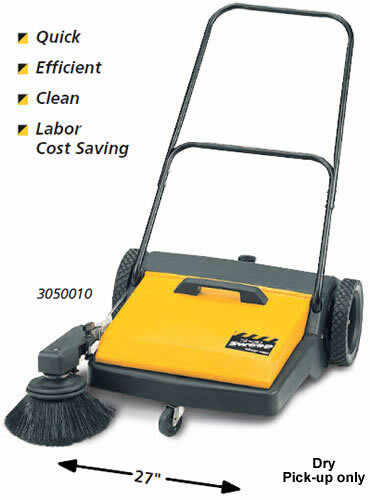 maintenance productivity with cleaner more efficient results. the debris into the large 1.4 cubic foot easy-to-empty hopper. Cleans a 27" wide path. Rubber seals provide dust free operation. brooms. Dent and rust resistant, structural foam frame and poly hopper. indoors or out. Heavy-duty nylon impeller mulches as it cleans. 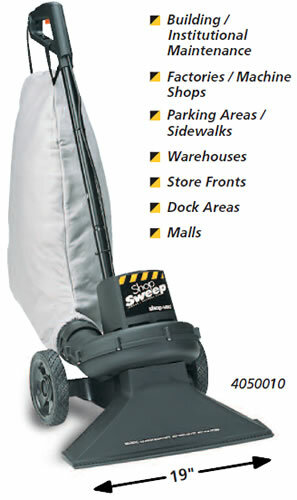 with durable nylon impeller, 19" wide nozzle with 1-1/2" intake. settings. Large 8 gallon easy-to-empty filter/collection bag. Safety switch. Built-in kick stand. Double Insulated. 28 1/2" x 27 1/2" x 12 1/4"
22" x 16 1/4" x 17"
Industrial Indoor/Outdoor Vac from your complete source for material handling equipment.